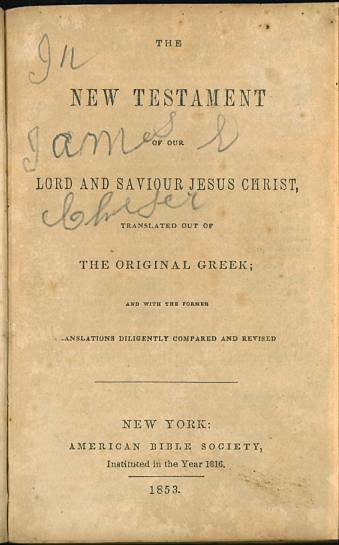 The American Bible Society was founded in 1816 and quickly became the major producer of inexpensive Bibles and New Testaments in America. 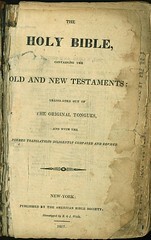 From the beginning they provided Scriptures in the Common English Version or the King James Version. They did this because they did not want to divide Christians by producing a version that would alienate any group. 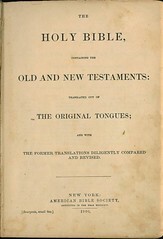 This page lists ABS versions produced in the 19th century. Obviously this list is incomplete because they produced literally millions of Bibles in many different editions. Any additions to this list are welcome. 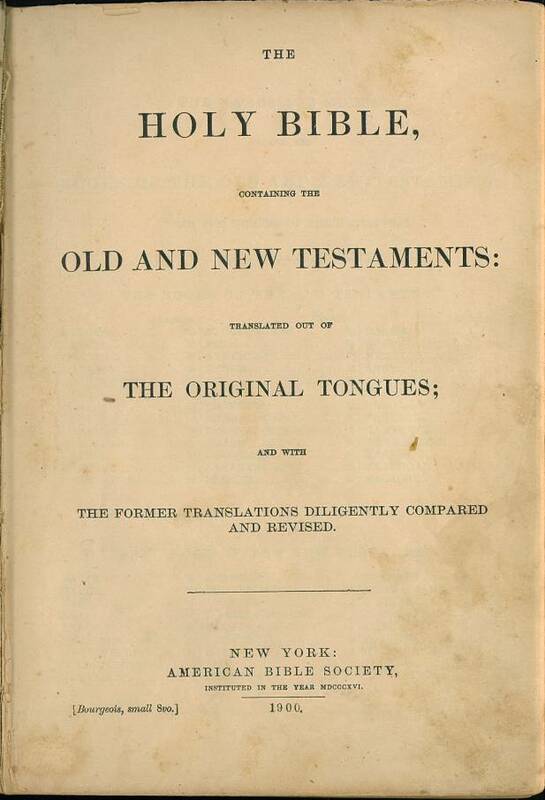 Title: The | Holy Bible, | containing the | Old and New Testaments: | translated out of | The Original Tongues, | and with the | former translations diligently compared and revised. | - | New York: | Stereotyped by E & J. 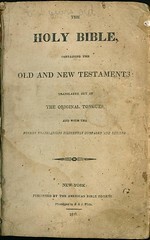 White, | For "The New-York Bible Society," and "The Auxiliary | New-York Bible Society." | - | 1816. 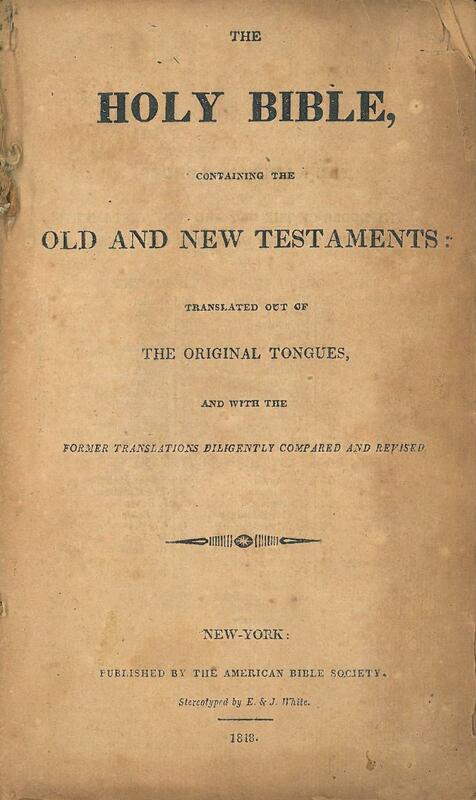 Title: The | Holy Bible, | containing the | Old and New Testaments: | translated out of | The Original Tongues, | and with the | former translations diligently compared and revised. 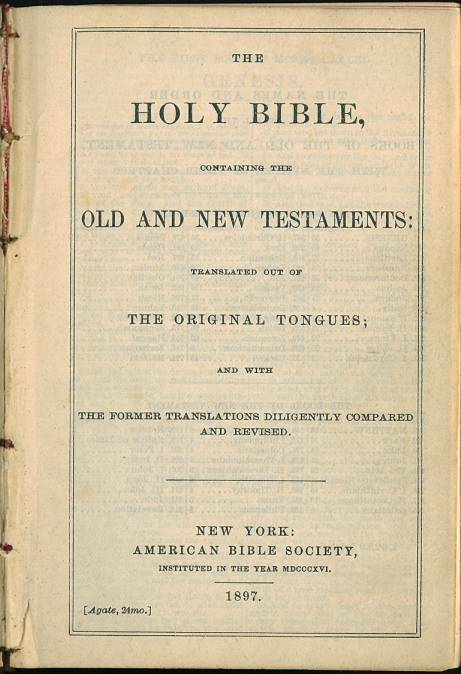 | - | New York: | Published by the American Bible Society. | Stereotyped by E. & J. White. 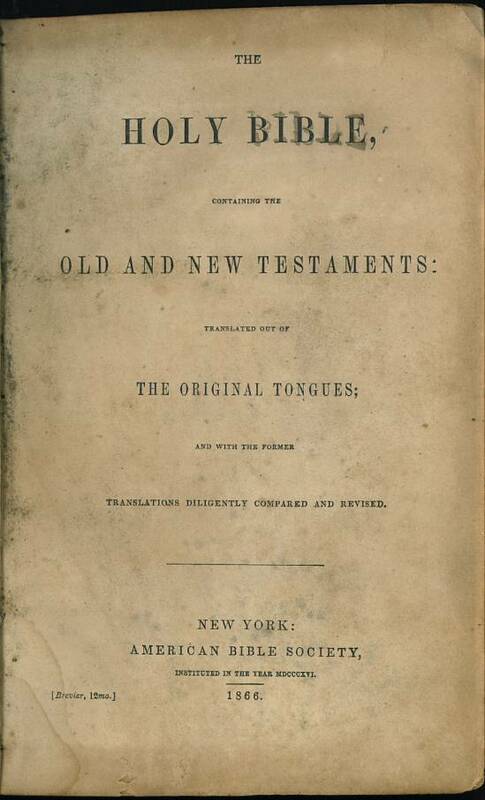 | 1817. Comments: According to Hills this is a reprint of Hills 303. 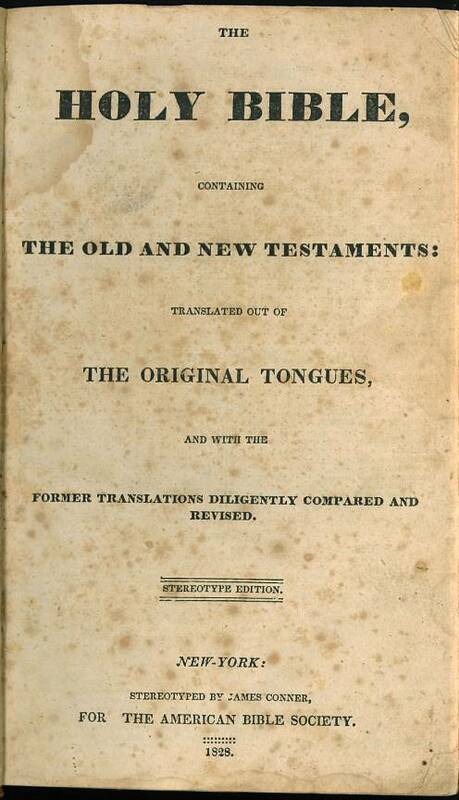 Title: The / Holy Bible, / containing the / Old and New Testaments: / translated out of / The Original Tongues, / and with the / former translations diligently compared and revised. / - / New York: / Published by the American Bible Society. / Stereotyped by E & J. White / - / 1818. 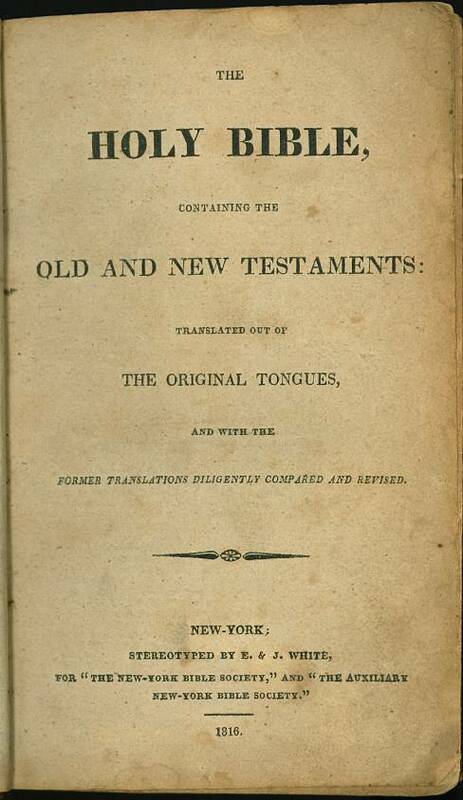 Title: The / Holy Bible, / containing the / Old and New Testaments: / translated out of / The Original Tongues, / and with the / former translations diligently compared and revised. / - / New York: / Published by the American Bible Society. / Stereotyped by E & J. White / - / 1819. 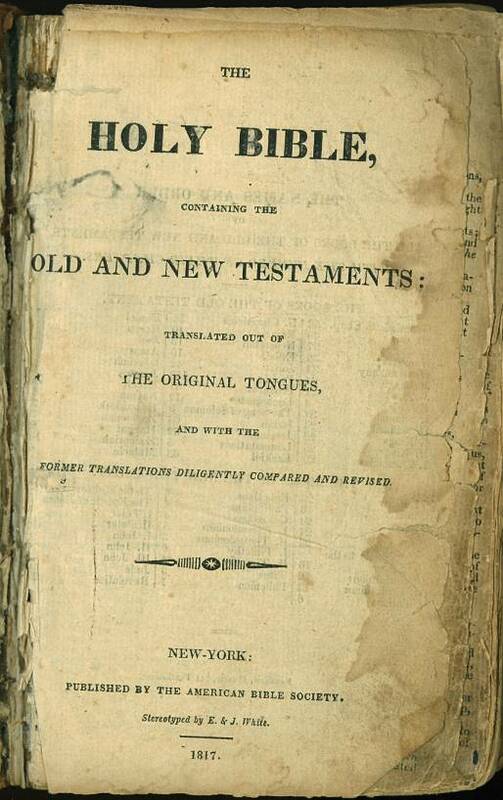 Title: The / Holy Bible, / containing / The Old and New Testaments: / translated out of / The Original Tongues, / and with the / former translations diligently compared and / revised. / - / Stereotype Edition. / - / New York: / Stereotyped by James Conner, / for the American Bible Society. / - / 1828. 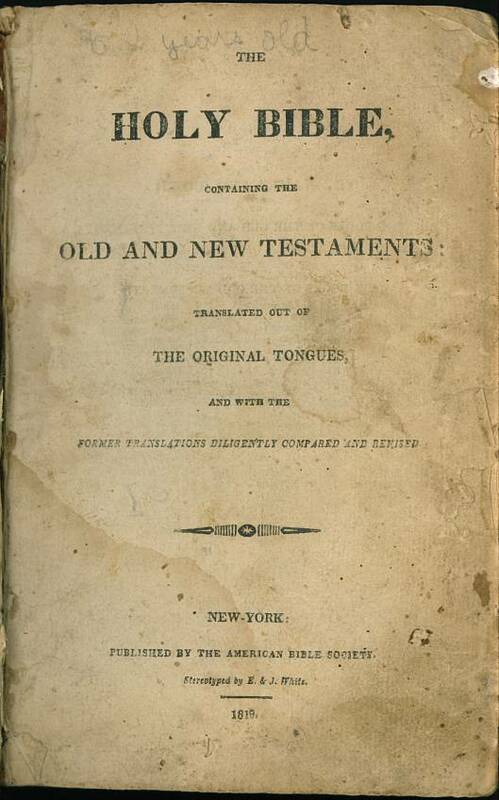 Title: The / New Testament / of our / Lord and Saviour Jesus Christ, / translated out of / The Original Greek; / and with the former / translations diligently compared and revised / - / New York: / American Bible Society, Instituted in the Year 1816. / - / 1853. 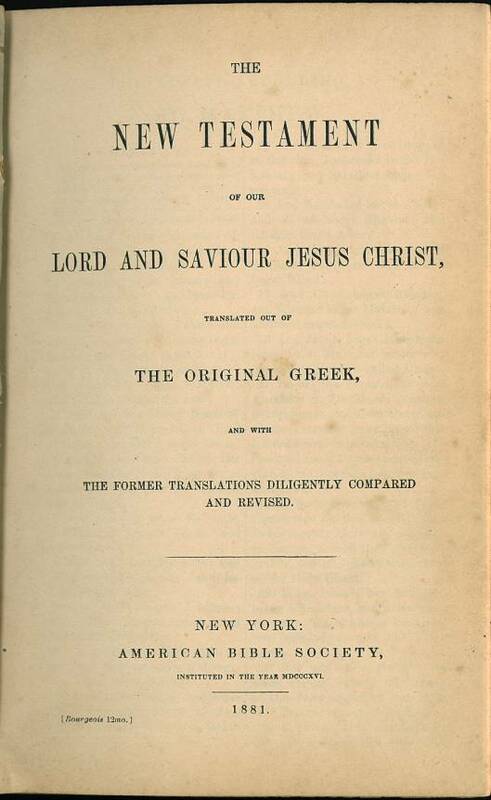 Title: The / New Testament / of our / Lord and Saviour Jesus Christ, / translated out of / The Original Greek, / and with / the former translations diligently compared / and revised. 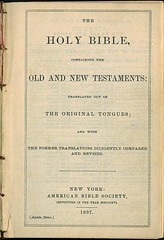 / - / New York: / American Bible Society, / Instituted in the Year MDCCCXVI. / - / 1881.